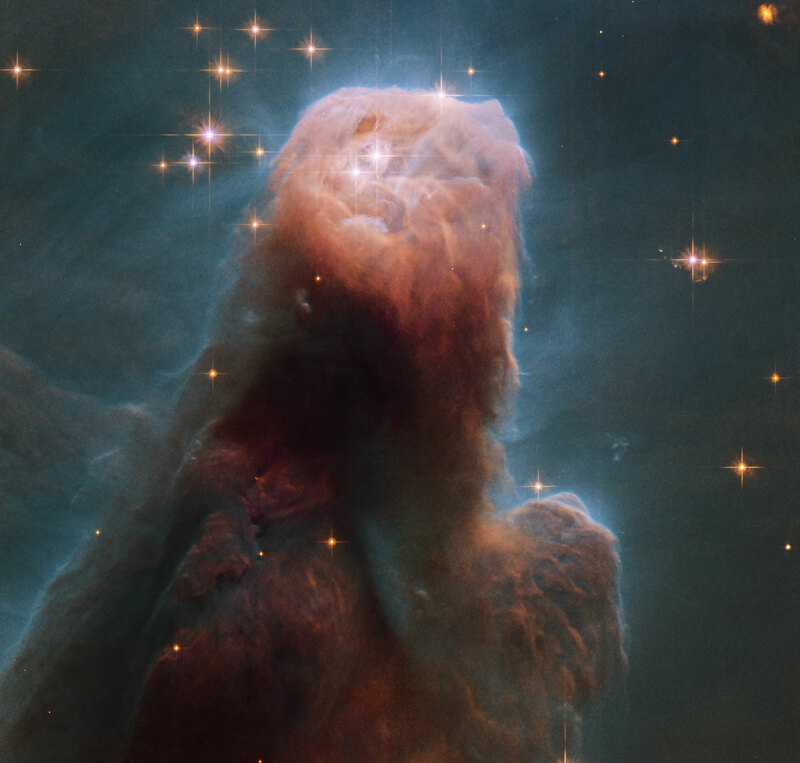 Explanation: Stars are forming in the gigantic dust pillar called the Cone Nebula. Cones, pillars, and majestic flowing shapes abound in stellar nurseries where natal clouds of gas and dust are buffeted by energetic winds from newborn stars. The Cone Nebula, a well-known example, lies within the bright galactic star-forming region NGC 2264. The Cone was captured in unprecedented detail in this close-up composite of several observations from the Earth-orbiting Hubble Space Telescope. 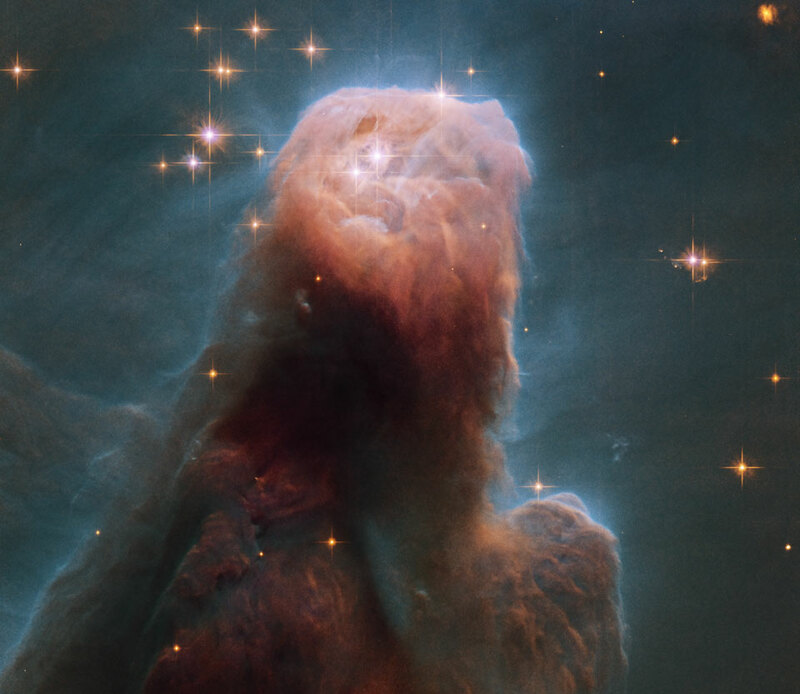 While the Cone Nebula, about 2,500 light-years away in Monoceros, is around 7 light-years long, the region pictured here surrounding the cone's blunted head is a mere 2.5 light-years across. In our neck of the galaxy that distance is just over half way from the Sun to its nearest stellar neighbour, the Alpha Centauri star system. The massive star NGC 2264 IRS, seen by Hubble's infrared camera in 1997, is the likely source of the wind sculpting the Cone Nebula and lies off the top of the image. 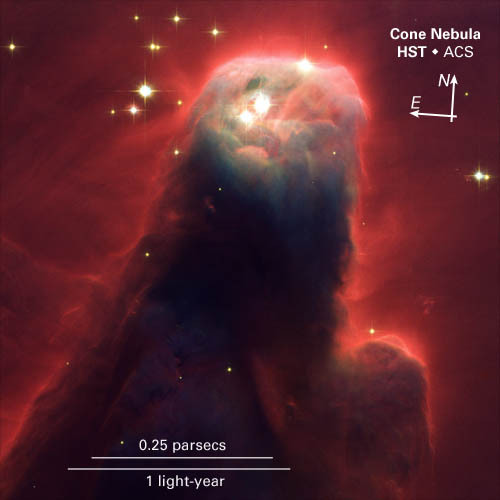 The Cone Nebula's reddish veil is produced by glowing hydrogen gas.